These 35 questions are all you need to find the right recruiting firm, as well as your dream role. 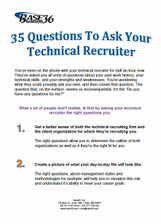 Your initial conversation with a technical recruiter can help you to determine whether or not pursuing a role with this recruiting firm, or their client company, is worth the time and effort. And all it takes to determine this? Are you ready to learn the key questions that will weed out the good companies and roles from the bad? If so, simply fill out the form on the right! Download the Free Question Guide Now!